Effective risk management is essential for all legal practices. This new edition is designed to help your firm to formulate and implement appropriate procedures and policies to identify, mitigate and manage risk. 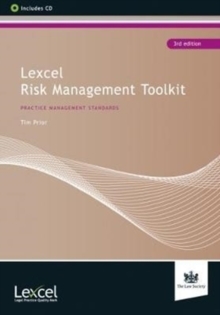 It contains a number of new templates to help manage risk at three levels, as identified by Version 6 of the Lexcel Practice Management Standard. These are strategic risk, operational risk and regulatory risk. This third edition has been comprehensively revised with the needs of law firms in mind and includes:* an anti-money laundering policy which covers the appointment of a nominated officer, usually referred to as a money laundering reporting officer (MLRO)* a procedure for making disclosures within the practice and by the MLRO to the authorities* procedures for checking the identity of the practice's clients* a plan for the training of personnel* procedures for the proper maintenance of records. Templates and documents are included on the accompanying CD-ROM for easy customisation. This book will help save time and money and help your firm achieve best practice with or without full Lexcel accreditation.